I just love the clasp on this bracelet. 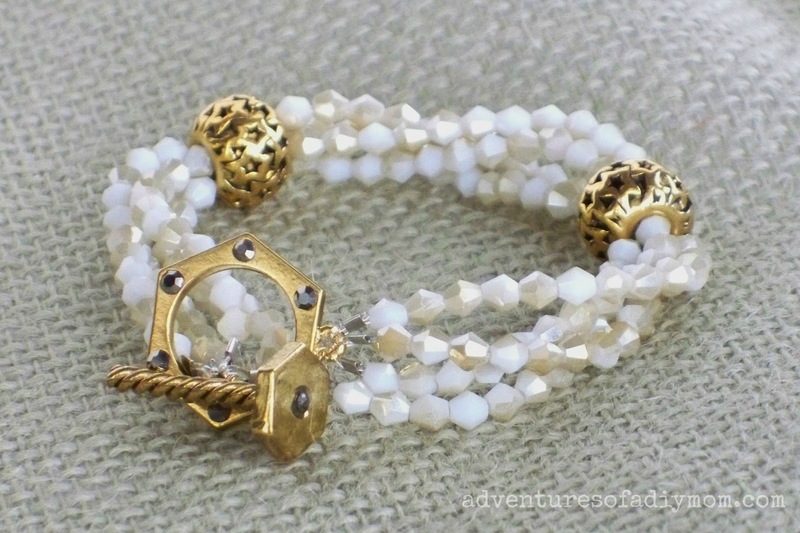 It's the nuts and bolts toggle from Prima Bead. It's perfect for a diy girl like myself. I also really like the beads - they're called bicone mirror beads and they come in all different colors. Half of the bead has a reflective coating. It gives it a nice shimmery effect that I LOVE! I took some pictures while I was making it, but they turned out awful. Plus, I didn't take them of the whole process. I'm not sure what I was thinking. So I hope the instructions are clear enough that you can make it without step-by-step pictures. 1 - Cut (4) 12” lengths of stretch cord. 2 – Using 4 crimp tubes attach each cord to the toggle end. Clip excess cord . 4 – Thread a gold star large hole bead onto all 4 of the strands. 5 – String 12 beads onto each cord. 6 – Thread the other gold star large hole bead onto all 4 of the strands. 7 – String 12 beads onto each cord. 8 – Attach each strand to the other toggle end with its own crimp tube. Be sure to keep the strands tight and even with each other. Get all 4 crimp tubes in place before clamping down. Clip excess cord. Love the design! The gold really does set off the crystals well.